User based machine operating concepts for factories of the future are oriented around user habits we recognize from smartphones and tablets. Touch and gesture controls have been integrated into operating panels and are also part of the connections between cloud services and operating devices. The next generation of machine operators expects a human-machine interface that meets the standards they are used to finding on their personal mobile devices in their private lives. In the work environment, new smart devices are appearing in more areas than just management and distribution. Production managers and service employees in the industry are also benefitting from having machine statuses, data sheets or service plans constantly accessible from anywhere via the web. The result: Reduced machine downtime and increased productivity. 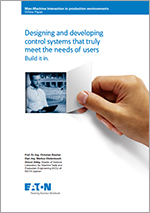 In his white paper “Designing and developing control systems that truly meet the needs of users”, Simon Sittig, a researcher at RWTH Aachen University, explains how the Industry 4.0 environment controls an ever growing influx of information and can be used to increase efficiency. Here, role concepts can be used to ensure that only relevant data is allocated to a particular user group. By adjusting information to a given work situation, the working context, the information can be prepared in an even more targeted way. He also discusses the use of new technologies such as smart watches, which are better known for their application within the consumer environment. You can also read our white paper “Innovative operating concepts for the next generation of machines” in the “Further Information” section. It looks at the conflicting priorities between new design options for operating panels and compliance with the relevant standards and guidelines. In addition, the paper examines the human-machine interface as part of the overall system architecture. Please provide us with some information and download the white paper. 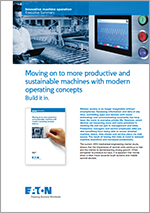 In the white paper “Innovative operating concepts for the next generation of machines”, Tobias Ischen proposes new operating and visualization concepts and examines options whereby machine manufacturers, in light of the applicable standards and guidelines, can already start developing their solutions today in a way that satisfies the requirements of Industry 4.0/IoT as well as the needs of future operators, or “digital natives”. He also takes a look at the future of the Human Machine Interface (HMI). 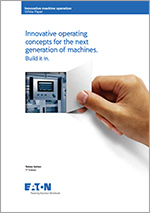 This abridged version is an introduction to the white paper “Innovative operating concepts for the next generation of machines”. It provides an overview of current and future developments in operating panels for mechanical engineering, how they can be incorporated into the digital world, and what effects this has on manufacturing productivity. 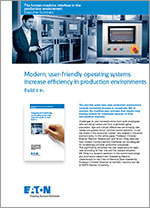 The executive summary “Increasing efficiency in production environments through modern, user-oriented operating systems” provides a brief overview of the white paper by Simon Sittig, a researcher at RWTH Aachen University. The white paper demonstrates how organizations deploy forward looking operating concepts that provide role based information on different operating devices, such as mobile operating terminals, as well as cutting edge technologies. 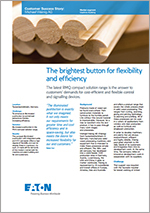 Read the summary of the white paper to get a brief overview. 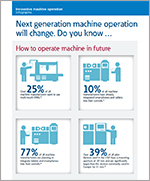 Next generation machine operation will change. Do you know how? This entertaining infographic provides the viewer with a brief overview of the results of various studies. Using data from studies including those conducted by the Frauenhofer Institut and the 2016 mechanical engineering market study by Michaela Rothhöft, the infographic highlights how humans and machines will interact in the future. New machine controls will increase machine productivity and meet the requirements of the next generation of machine and system operators. IMS Robotics is constantly working to improve its product line of sewer robots and related accessories. In its drive for better performance and greater industrial applicability, the company relies on Eaton’s expertise in the areas of controls, drives and circuit protection. This cooperation resulted in the optimization of machine operation and control with Eaton’s XV300 platform for a broader range of application, the customization of the Galileo visualization system, and the birth of a new generation of robots. Michael Weinig AG “Perfectly protected in environments with high levels of dust”. The machines provided by German company Michael Weinig AG from Tauberbischofsheim cover the entire process chain of solid wood processing. 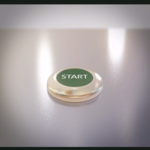 The company was searching for an operating concept for push-buttons that corresponded to its workflows and could be integrated into the machine body at any location, on request by customers. Given the high levels of dust in the environment, the chosen solution needed to offer high levels of protection for the push-button connection while remaining cost effective and flexible to install. 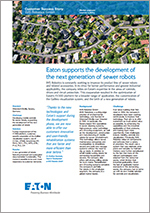 Read on to find out how Eaton solved this problem for Weinig. At the plant in Iffezheim, KBI Kieswerk und Baustoff-Industrie Kern GmbH & Co. KG (KBI) can produce around 200 tons of gravel per day. Loose rock from a lake is first sieved before being ground and prepared at the crushing plant to produce crushed stone and grit. 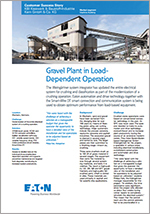 The gravel plant required a new durable and easy to use operating panel with innovative multi-touch technology. Read about how Eaton’s solution partner Weingärtner deployed a solution using Eaton technology in just four weeks during the annual vacation period. The booklet makes suggestions about the design of human-machine interfaces for the next generation of operators and machines. 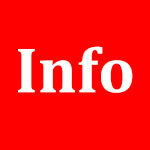 It presents various alternative system architectures with different communication options in a solution overview. This includes touch panels, from HMI to HMI/PLC and industry PCs, and the push-buttons used in mechanical engineering with built-in dimensions of 22 mm and 30 mm; design variants (flat and standard fronts) as well as alternative protection types on the reverse (for directly building into the machine room). In addition, it demonstrates how machines can easily be connected to cloud and mobile end devices using the OPC UA standard. Whether you only need a single command point or want to furnish a whole board, our push button configurator will help you select the right option, quickly and intuitively. What’s more, it covers Eaton’s entire range of pilot and control-circuit devices. High-end machines are immediately identifiable by their good design. It is therefore no surprise that machine builders are paying increasingly close attention to the design of the operating level. To give them greater choice in this area, Eaton offers a high-end range of flat pilot and control-circuit devices, in addition to our standard series. 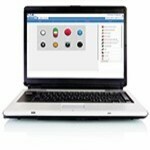 Find out about the latest generation of pushbuttons. Innovative design combined with proven quality. 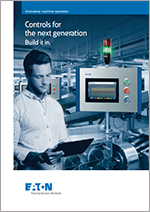 Multitouch control panels from Eaton meet the expectations of the next generation of machine operators.